Sometimes school day mornings can be rushed. OK, MOST school day mornings ARE rushed. They eat breakfast while I finish packing lunches, then wrangle shoes while brushing teeth and fix hair while zipping backpacks. Before I know it they're walking into the building – just as I fully awake and realize I'm going to miss them all day! I want to run after them and fit in one more squeezer hug! So, last night I planned ahead. 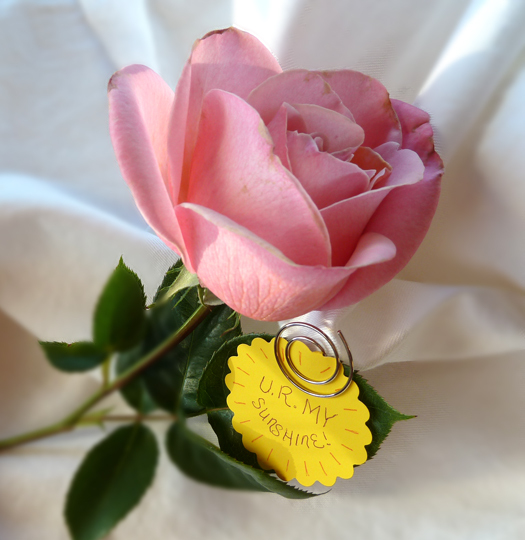 My kids love to smell and notice the daily crop of blossoms on our assorted rose bushes. I snipped one of the nicest blooms to set by their breakfast setting today. 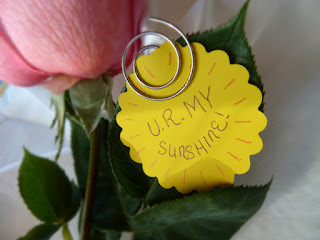 I quickly cut a sun out of bright yellow paper and added in colored pen "U. R. My Sunshine." A fun swirly paper clip holds it to a leaf. Oh, I can't wait for summer vacation! How about you? So sweet and so thoughtful! Oh how precious! Yes, summer vacation, bring it on. It's our last hurrah before kindergarten and I want to make the most of it! Oh, how sweet and I am sure will be something they remember and pass on when they have little ones.